Is Dieting the Best Way to Achieve Permanent Weight Loss? What do you think? IS dieting the best way to achieve permanent weight loss? Assuming of course, that you believe that permanent weight loss is even possible! Sadly, many smart successful women do not. Even though you’ve achieved wonderful success professionally, you’ve had so much struggle with food and your weight that permanent weight loss can seem like a far off fantasy. In yesterday’s article we answered the question “What IS permanent weight loss?” since so many millions are struggling just like you, right now, with food and their weight. These folks are right there with you, finding it hard to imagine lasting relief from the stress, the food drama, and the yo-yo dieting that is simply a part of your life today. Because struggling with your weight is the only way you know, permanent weight loss can feel like your white unicorn! But still, you’d love to have it. Right? 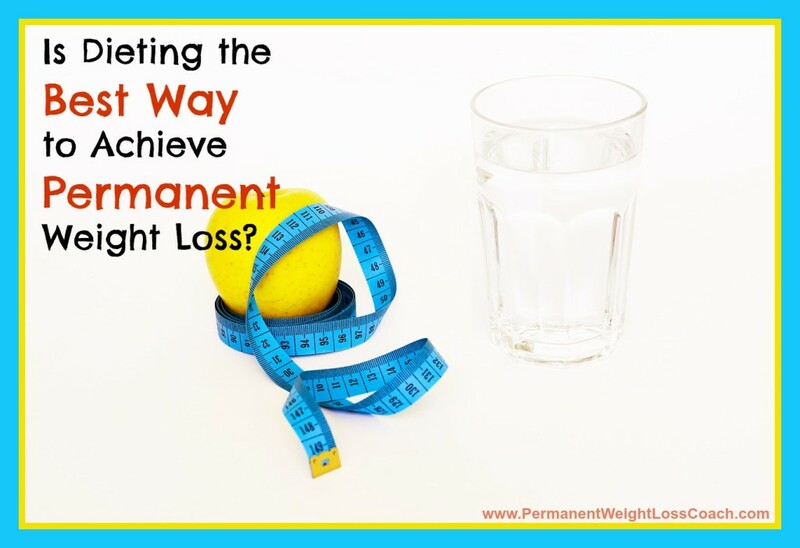 Who wouldn’t love to achieve permanent weight loss? However that brings up a massive problem: since you’ve never achieved permanent weight loss on your own, you don’t know how to do it. How do you know this to be true? Because if you knew how, you’d be living the permanent weight loss way right now! Of course you would. Ok, so since you don’t know how to achieve permanent weight loss on your own, and you haven’t hired a stellar permanent weight loss coach (like me!) to mentor you through the proven steps (like my clients have already done) it’s really very easy to think that dieting is the best way to achieve permanent weight loss. Why? Because it’s all you’ve ever known. The big problem here is that just because dieting, yo-yo dieting, stress and worry is all you’ve ever known when it comes to your weight, it doesn’t mean that this is the solution to your ongoing problems with your weight. Don’t you agree? I love Einstein’s definition of insanity. Have you heard it before? It goes like this: “Continuing to do the same thing over and over again while expecting a different result is the definition of insanity.” ~ Albert Einstein. What is interesting is all of the dieters who right now are thinking that if they keep doing the same thing over and over again (dieting) and that then, dieting is the best way for them to achieve permanent weight loss! But how does that work, when it’s never worked before? If dieting really were the way to permanent weight loss, then why are so many millions still struggling? Struggling just like you are struggling with food and your weight. If dieting were the key to permanent weight loss, and there are already hundreds of diet books you can pick up right now, free at your public library, then why is there any struggle? Why does anyone struggle with their weight when diets are freely available online, at the library, and on Youtube? So maybe…dieting is NOT the best way to achieve permanent weight loss. Because if it were, then you’d already be living in total peace and harmony with food and your weight, wouldn’t you! Of course you would. Stay tuned for tomorrow’s post where we’ll look at WHY dieting is not the best way to achieve permanent weight loss. But first, leave a comment below to share your biggest Aha from this article! Do YOU believe that dieting is the best way to achieve permanent weight loss? What has been your experience?